by A. E. Nordenskiold ca. 1879, and is in the Ethnographic Museum of Sweden, Stockholm. 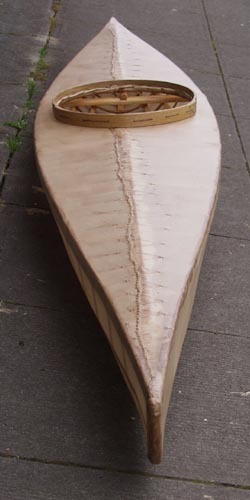 Despite its comparatively short length and flat deck, this kayak has a lot of room in it. Its depth-to sheer is 10-1/2" at the front of the cockpit, so it has considerable volume. 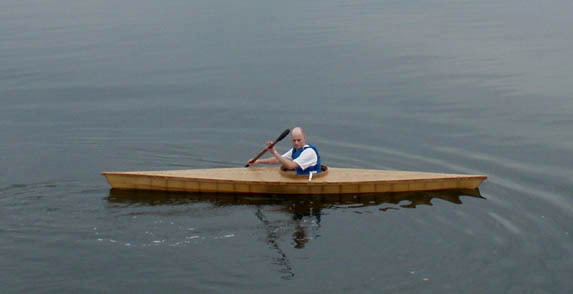 The original, as depicted in Zimmerly (2000:12,fig.10), did not have a coaming, and appears to have never had one. On the water, March 2007.